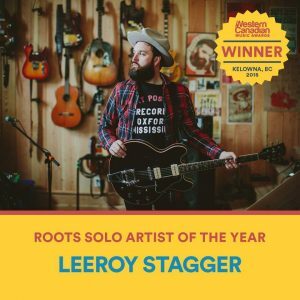 Victoria’s Leeroy Stagger was named Roots Solo Artists of The Year at the 2018 Wester Canadian Music Awards held at the Laurel Packing House in Kelowna Thursday October 11, 2018. Stagger was also nominated for Recording of The Year. Other Victoria artists nominated for awards included Jesse Roper, Astrocolor, Michael Kaeshammer, Steve Bays, Moka Only, Band of Rascals and Victoria Guitar Trio. Industry awards will be handed out Saturday, October 13th at an industry awards brunch. The Western Canadian Music Awards is part of the 2018 BreakOut West music festival and conference.